CENTRED TO LOWER RIGHT. LIGHTLY TONED. OTHERWISE FINE - FAIRLY CLEAN AND FRESH CONDITION (CAT. ). St Vincent: REVENUE1884-85 x4 different Barefoot 16, 18, 19 & 23 all used with manuscript cancellations; good condition.Cat. £27.50 (Barefoot 2019). 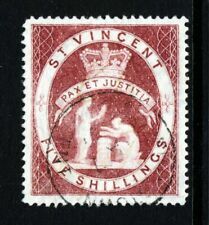 St Vincent: REVENUE1882-83 wmk. Crown CA 1d bistre & 1d red Barefoot 9 & 10 both used with manuscript cancellations; good condition.Cat. £28.50 (Barefoot 2019). Five Shillings Lake. made with love by. Catalogue Value £55 . Very Fine Used. Five Shillings Lake. made with love by. Very Fine Used Catalogue Value £55 . St VINCENT. S.G. no 16. U.K. 1.4. Made with love by. Very Fine Used Catalogue Value £23 . New Colours Five Pence Sepia Line Perf. 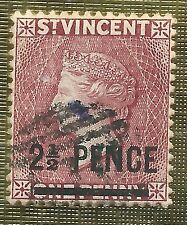 ST VINCENT Queen Victoria 1897. Very Fine Used Catalogue Value £30 . U nmounted mint See Pics. Very Fine Used Catalogue Value £20 . made with love by. The KeyPlate Part Set. From the range SG 67 to SG 73. Add to Favourites. Very Fine Used Catalogue Value £76 . Complete Set of 9. Fine Mounted Mint. 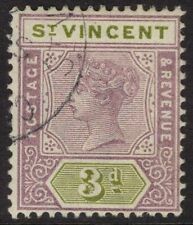 St Vincent 1899 QV 6d dull mauve & brown MLH. SG 73. Sc 68. St Vincent 1899 QV 6d dull mauve & brown mint lightly hinged. Gibbons # 73. Scott # 68. A GOOD MOUNTED MINT STAMP. St Vincent Kings and Queens of England 12 First Day Stamp Covers Dated Feb 1977. Dispatched with Royal Mail 2nd Class Comprehensive very informative book covering all the Kings and Queens Of England from William the Conqueror 1066 - Queen Elizabeth 11 1952- . A page of Information about each king and an envelope mounted within the page with the Kings / queens and a First cover stamp dated 7th February 1977 from Kingstown St Vincent all addressed to the same collector . There are 12 in total - all in very clean unused condition . The hardback book is also very clean no damage to pages - creasing , foxing etc looks as it would on first day of buying - well looked after. There is some scuffing on the back of the book - see photos . Complete Set of 9. Mounted Mint. One Penny Black. Catalogue Value £70 . MINT Hinged. Add to Favourites. One Shilling Brown. made with love by. Catalogue Value £160 . Very Fine Used. A FINE USED STAMP ON PIECE. 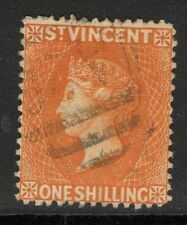 St Vincent 1885 QV 1d on 2½d on 1d lake very fine used. SG 46. Sc 55. Gibbons # 46. Scott # 55.